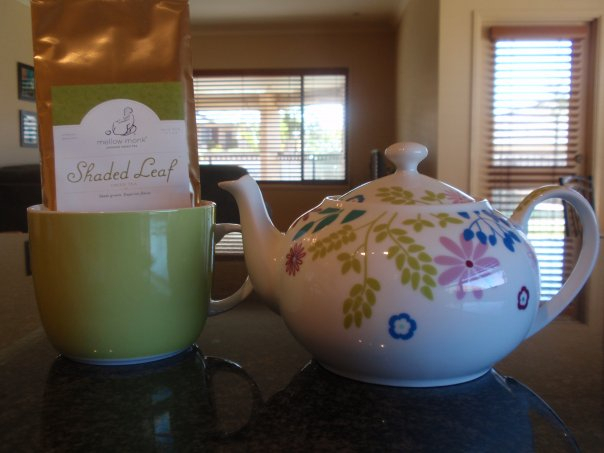 Kelly McGeachie has written a review [Facebook link] of our Shaded Leaf Green Tea. For those who have trouble accessing her Facebook note, I have pasted the text below, after the photo accompanying her review. Mellomonk Green Tea review OCTOBER 2009. One thing I love and cherish is the opportunity to sit in my armchair in my bedroom with a steaming cup full of tea, a magazine and my teapot sitting right next to me on the table. ; ready for a quick top-up. I've always been an avid black tea drinker, whether it be English Breakfast or some spicy chai; but a couple of years back a friend of mine overseas introduced me to the wonderful world that is 'Green Tea'. I'd tried a couple of brands of tea bags and other loose leafs in the past, as I'd heard so much about the wonderful health benefits of drinking Green Tea. To be honest I really wasn't that fond of it! Can you relate to this yourself? This friend of mine kept telling me I should try something else when it came to my Green tea. Tea bags are NOT and never are the answer, he told me. He suggested I try this brand called Mellow Monk that he had been buying for a while. 'You gotta get in touch with the monk kel' he'd say to me. In a surprising bout of generosity my friend sent me some of this Mellow Monk tea to try. When I received it I was instantly drawn to the pretty foil packaging and really couldn't wait to try it. (This stuff is leaf tea by the way). The taste was something out of this world. So much so that since my first packet of Mellow Monk I haven't looked back and I never even touch black tea anymore. Well, unless I'm round a friend’s house and feel the need to be polite in accepting it. Today, I received a packet of Mellow Monk's latest Green Tea called 'Shaded Leaf’, a Sencha tea which I have yet to try,. As the name connotes the leaves are shaded about 21 days before harvest, blocking out 90% of sunlight, this then stimulates the plant to make more of the super healthy catcheins, that we know are so good for us. To prepare, I grab my teapot and boil some water. I 'walk away' for a while to let the water cool to as close to 75 degrees as possible (The perfect brewing temperature) I then put a level teaspoon of Shaded Leaf into my tea pot and steep it for approximately three minutes. I strain the leaves and pour the tea into my cup (step by step instructions, very important you see) and voila! The tea is ready! The strained leaves almost represent a paste after use, they are so moist and fresh I cannot begin to tell you. From a few past brands I had tried from my local health shop the leaves were always so dry. Apparently this is not how your leaves should be. eco-friendly farms, that have minimal environmental impact! The quality really is fantastic! and did I mention the service yet? always answer any questions you may have etc. website at http://www. mellowmonk.com and see what tickles your fancy! There is much variety to choose from.